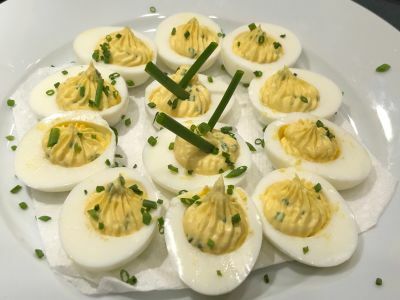 Deviled eggs are a favorite for every cookout or holiday celebration. This recipe tends toward the milder side without the addition of mustard or vinegar. Just a personal preference but try it, I think you might like it. It allows a little more of the egg to come through. In this recipe we mix the "dressing" together before we mix it with the yolks. Most recipes add the yolks and all the ingredients to a bowl and then mix. This can lead to some very inconsistent results due to the size and moisture content of the cooked yolks themselves. Since the dressing is made separately, we can add more or less to the yolks to get the consistency we want so it is always in the right proportions. It also makes it easier to taste along the way because the amount of dressing has as much affect on the mixed product as the actual ingredients used. 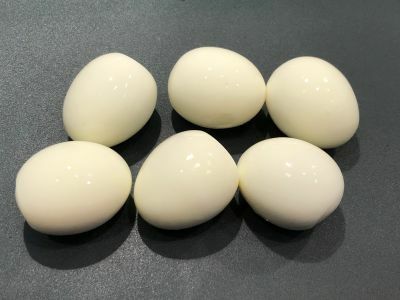 And be sure to use our Technique for making Perfect Hard Boiled Eggs that Peel Every Time. After many years of getting frustrated peeling eggs, this actually works pretty much every time. So give it a try and be sure to come back and tell us how you change it to make your very own deviled eggs. Enjoy! Note - I like to use Duke's which is not available in all stores. You can buy it online and Walmart does carry it in most stores I believe. It is a southern mayo and has a little tangier taste than most store brands. If you are using store brand mayo, you can add 1/2 t dijon mustard or rice wine vinegar to add a little more tang if you want that. Note - If dairy is an issue, go ahead and substitute mayonnaise here. Then, like in the previous note, add 1/2 t dijon mustard or rice wine vinegar. You should only have to add the mustard once but taste it before you mix it with the yolks. 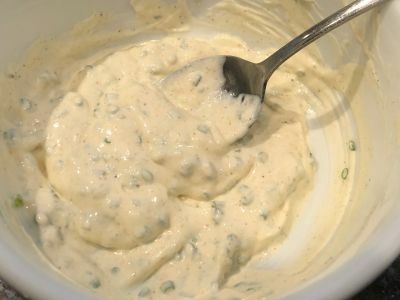 Also, if you are making these for an outdoor picnic in the summer and they will be sitting out in the sun, you may want to consider using all mayonnaise and make sure it is a pasteurized mayonnaise so it won't spoil in the sun. 1. 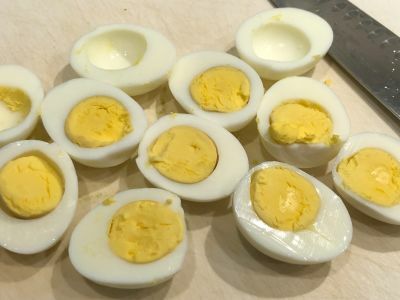 Peel eggs and cut in half. 2. 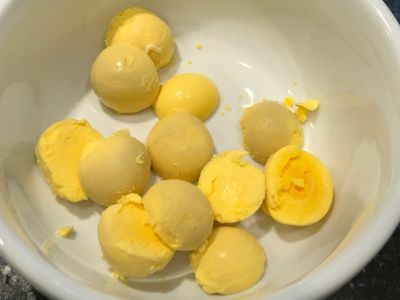 Remove the yolks and put them in a mixing bowl. Reserve the whites for filling. 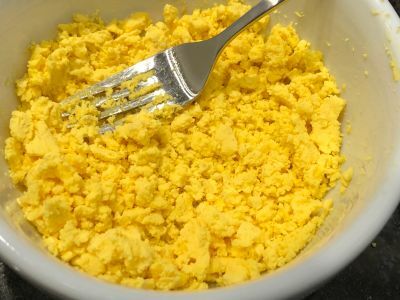 Mash the yolks with a fork. 3. 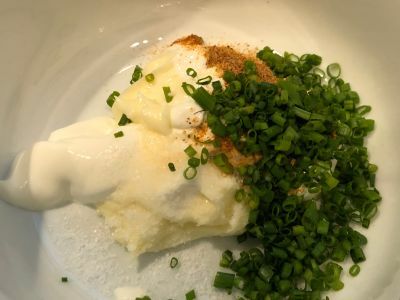 Add the mayonnaise, sour cream, chives, seasoning and salt to a bowl and mix thoroughly. 4. Add about 3/4 of the dressing mix to the yolks and mix thoroughly. If it is a bit too dry for your taste, add some more and mix until the desired consistency is achieved. 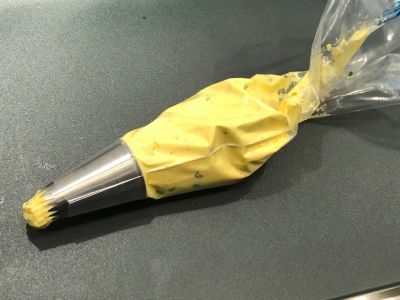 If you will be using a piping bag to fill the eggs you may want it just a bit looser then if you are filling with a spoon. 5. 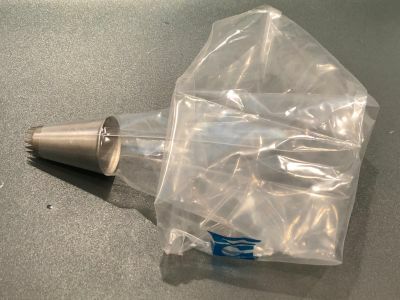 Using a piping bag or a plastic zip lock bag, pipe yolk mixture into the egg white halves. Or just spoon the mixture evenly into the egg whites and garnish. 6. Fill the eggs so the yolk mixture fill the cup in the egg white and is over the top by a bit. 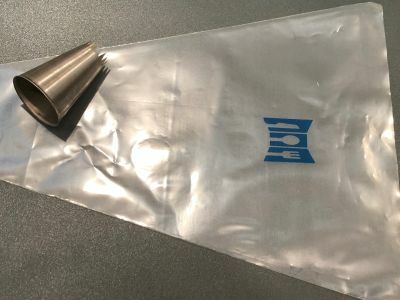 You do not want to overfill it because it is harder to eat and also may spill over the side. 7. If you have time, refrigerating the eggs will help them solidify a bit. They are also best served cold but that is not necessary, they will be fine at room temperature also. If you are taking them outdoors, try to keep them out of direct sunlight and if it is a particularly hot day, they can become somewhat runny and unattractive so you may want to put them out in batches. 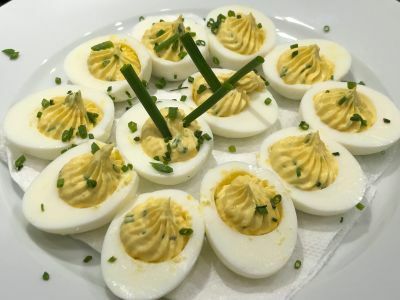 Place your deviled eggs on a serving platter, sprinkle with paprika or chopped chives, or stick in a few longer pieces of chive to add some height to the dish. I like to put a paper towel under the eggs to keep them from sliding around the plate if you are going to be traveling or passing them around. That is if you don't have a deviled egg plate with the individual little cups in it. So give this a try and make adjustments as you see fit. And again, if you make the dressing separately from the yolks, you can adjust it along the way to your liking. Let us know how you make out. Enjoy! 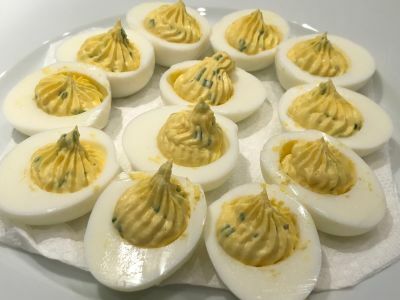 I love the idea of adding Old Bay to my deviled eggs. Hope to make some next week and want to try it!